In this episode Shahriar reviews and demos the second revision of the industry’s first Mixed Domain Oscilloscope from Tektronix. The MDO4000B series offers improved signal integrity and performance. The reviewed model is a MDO4104B-6 which offers 16-Channel Logic Analyzer, 4-Channel Oscilloscope with 1GHz of analog bandwidth as well a 6GHz Spectrum Analyzer with greater than 1GHz of instantaneous capture bandwidth with 65dB of dynamic range. After an overview of the instrument’s interfaces and built quality, the block diagram and principle operation of the instrument is explained. The time-correlated digital, analog and RF capturing capability is described and its advantages for debugging complex mixed-domain systems is explored. Instrument probes, accessories and various modules are also presented. The instrument is used to measure an ultra-pure single-tone signal at various frequencies for THD, SFDR and dynamic range measurements. For the main demonstration, a complete I/Q modulator system prototype is presented. The prototype includes a Maxim MAX2721 modulator, external PA, antenna diversity switch SW-277, digital control circuitry, power-grid DC-DC converters, external step attenuators, an Agilent E4342B synthesizer for LO generation and an Agilent N6020A arbitrary waveform generator for baseband signal generation. 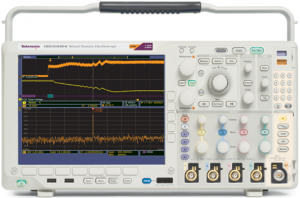 The Tektronix MDO is used to monitor RF, baseband, digital and power-supply analog waveforms. The system includes an array of problems including intermittent spurious tones, power supply dependent spectral noise, antenna switching glitches and 256-QAM constellation imperfections. The MDO is used to analyze, measure and solve all system problems. Tektronix SignalVu is used to analyze the system performance. As a final experiment, the MDO is used to demodulate a 1GHz bandwidth 32-QAM 500MS/s signal centered at a 3GHz carrier. The experiment documents can be downloaded here. Great vid, amazing details, keep them coming! Wow! this is one of your best, if not the best video you have made so far.. I love learning from you! You are the only person online that I know of that is making such detailed, well thought out and well planned videos of RF signal analysis. Thanks so very much, and please keep them coming, whenever you have free time! Shahriar – Just wanted to say thanks for making these videos!! They have inspired me to start looking at equipment and attempting to repair it. I’ve always been interested in electronics but never thought I new enough to troubleshoot/repair circuits. The other week I finally decided to undertake an Ebay repair starting with an Agilent 6611c that was listed as broken, font-panel not working. It was pretty much the cheapest broken piece of Agilent gear on EBay that I thought I could actually fix! After disassembling the rotary encoder, and hitting it with some DeOxit it worked perfectly. I was amazed that was all that was wrong with it! I decided to take an even bigger leap and bought a 81110A pulse generator that was broken. It was a really good price considering their brand-new cost, but a fair amount of money if I couldn’t fix it. I was able to use the techniques from your Agilent signal generator repair video to fix the pulse generator. After testing the power supply I discovered a problem with the -12V rail. Turning it off I saw the -12 V rail was shorted to ground. I was able to remove board by board until the short went away and then I knew exactly where the problem was. It turned out to be a SMT capacitor that had failed (). After replacing the capacitor and fixing a shorted solder joint on the main FPGA (probably caused by the failed cap) everything worked fine! The display is still broke, but I’m fairly confident that it’s the transformer. Even still I’m able to control it via GPIB, so I’m at least able to prove to myself that I fixed it. Thanks again man and chive on!! Fantastic video of a really cool instrument. Thank you. One question: what’s in the goblet on your bench? Wine or grape juice? Hooray – it’s another new Signal Path.